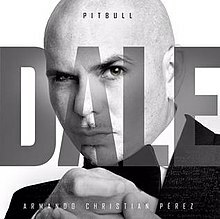 Dale (Spanish for "Hit it") is the ninth studio album by American rapper Pitbull. It was released July 17, 2015, through Mr. 305, Polo Grounds Music, RCA Records and Sony Music Latin. This album arrives five years after his latest Spanish-language LP Armando, released in 2010. AllMusic critic David Jeffries wrote: "It's the Pitbull album that feels most like a party with all these friends dropping in and out, and this wild night out peaks toward the end with the highlights running from the club-worthy "Baddest Girl in Town" (the first clue that this album isn't all-Spanish like Armando) to the '80s-flavored, Human League-quoting "No Puedo Más."" Jed Gottlieb of Boston Herald stated "If you really miss Pit’s lyrics, I suggest you make your own. I’m sure they’ll be better than “Big news, Pitbull, Tom Cruise, Mumbai I lit up their December night like the fourth of July, Vanilla Sky.”" Brittany Spanos of Rolling Stone noted that unlike Pitbull's previous Spanish language effort Armando, Dale "skips EDM and Southern hip-hop almost entirely in favor of a fuller Latin-fusion sound." The American edition of Rolling Stone magazine placed Dale at number 2 in the list for the "10 Best Latin Albums of the Year", arguing that the singer "volleys between English and Spanish with ease, flirting with dancehall and guaguancó elements, while bringing MCs from neighboring islands along for the ride." "Como Yo Le Doy" was released as the album's lead single on July 8, 2014. The track features Don Miguelo. "Piensas (Dile la Verdad)" was released as the album's second single November 20, 2014. The track features Gente De Zona. On July 24 there was released a Spanglish version of the song with Shaggy on Spotify. "Baddest Girl in Town" featuring Mohombi and Wisin, was released on June 8, 2015 as the album's third single. The song was performed by trio on Latin Award show- Premios Juventud on July 16, 2015. "El Taxi" featuring Sensato and Osmani Garcia, was released on May 15, 2015, as the album's first promotional single. The song is a Spanish adaptation of "Murder She Wrote", by Jamaican reggae duo Chaka Demus & Pliers. ^ "Pitbull - Dale collaborations". youtube.com. Retrieved 2015-05-29. ^ a b Jeffries, David. "Pitbull - Dale". AllMusic. Retrieved July 27, 2015. ^ a b Spanos, Brittany (July 17, 2015). "Pittbull - Dale". Rolling Stone. Retrieved July 27, 2015. ^ Gottlieb, Jed (July 17, 2015). "Pitbull, "Dale"". Boston Herald. Retrieved July 27, 2015. ^ Casillas, Andrew; Exposito, Susy; Raygoza, Isabela (December 30, 2015). "10 Best Latin Albums of the Year". Rolling Stone. Jann Wenner. Retrieved December 30, 2015. ^ "Itunes - Music- Dale by Pitbull". Itunes. ^ "Piensas". iTunes. Archived from the original on 2015-05-27. ^ "Baddest Girl in Town". iTunes. Archived from the original on 2015-07-12. ^ "El Taxi". iTunes. Archived from the original on 2015-05-27. ^ "Spanishcharts.com – Pitbull – Dale". Hung Medien. Retrieved August 8, 2015. ^ "Swisscharts.com – Pitbull – Dale". Hung Medien. Retrieved July 29, 2015. ^ "Pitbull Chart History (Billboard 200)". Billboard. Retrieved July 28, 2015. ^ "Pitbull Chart History (Top Latin Albums)". Billboard. Retrieved July 28, 2015. This page was last edited on 21 April 2019, at 01:18 (UTC).